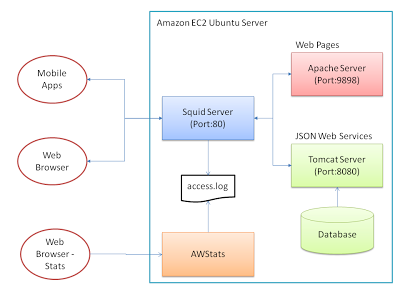 I’ve got a Java application running on Tomcat on Amazon EC2, which exposes RESTful web services delivering JSON to a variety of mobile apps and web sites. I’m running a Squid server as a reverse proxy caching in front of the web services, to cache defined content at the HTTP layer. This lets me run a pretty mixed environment, which suits my current purposes for delivering speedy content, removes load on my main app server and also doesn’t tie me to closely to any particular technical implementation in the back end. There is a complexity overhead, but part of the reason for doing this is to play with the technologies – so thats all part of the fun! At the moment, all this is running on a single EC2 Ubuntu server instance. 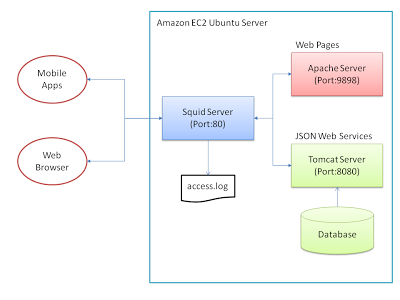 All HTTP traffic comes into the Squid server, running on Port 80. This caches certain html, image, json, php, etc content (as defined in /etc/squid3/squid.conf) – and if it can’t find the request in the cache (or has been told not to cache it), will hand off to one of the upstream servers to service the request – Tomcat (on port 8080 – serving my Java web services, and admin App) or Apache (on port 9898 – serving my web sites, PHP/HTML). 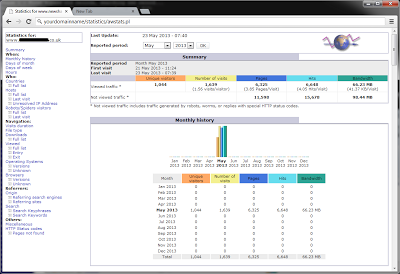 The Problem – How to Analyse Web Service Traffic? What I want to do is be able to track visitors across all web sites and mobile apps. 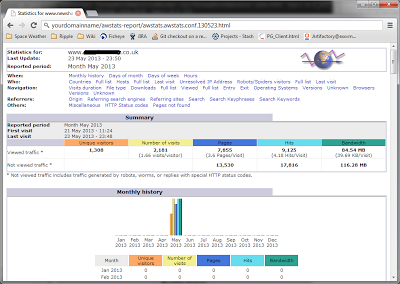 I can track website visitors fine using Google Analytics. However, the mobile apps access the web services directly – so a client based tracker like Analytics cannot track these requests..
We need to tell AWStats which log file we want to use, and what the format is. There are various ways you can configure your domain in AWStats. For simplicity here – I’m just assuming we have one domain and just use the ‘out-the-box’ awstats.conf configuration (I believe it is common practice to have different conf files for each domain – but we’ll just use the default for now). Found 412 already parsed records. Found 28 new qualified records. Now we have AWStats installed, and Squid logging the correct format, the next step is to setup Apache and Squid to view the reports. Because all our traffic goes through Squid – we just need to add some directives to ‘/etc/squid3/squid.conf’ to redirect any urls going via ‘/statistics’ directly to the Apache server. We also map ‘/awstats’ urls to the apache server too – to catch the css and js files AWStats references. So far – everything we do calls the awstats.pl perl script which re-generates the same web pages dynamically with the latest info. If you want to – you can also generate static web pages. For example – I want to generate static pages – a different set each day (with the year, day and month in the HTML page title). This will create a set of pages in ‘/var/www/awstats-report/’ with the format ‘awstats.awstats.conf.130524.html‘ (note: you will have to create the /var/www/awstats-report/ directory with the correct permissions. Take all the above with a pinch of salt – I’m sure there are better ways to do some of it, it was learning experience for me – and at the end, delivered what I was after. I think Squid is a great product, especially for a developer like myself who wants to play with different tech and swap it in/and out of my environment. It’s proxying abilities allow you to swap implementatations and server locations with relative ease. And in it’s main role – as a reverse proxy web acceleration server – it’s been performing excellently, speeding up web service and image serving with never a grumble. Now I have AWStats up and running – I can drill down and get a lot more information about what’s going on under the covers!